The inlaws are coming over for an impromptu dinner and you haven’t planned anything! 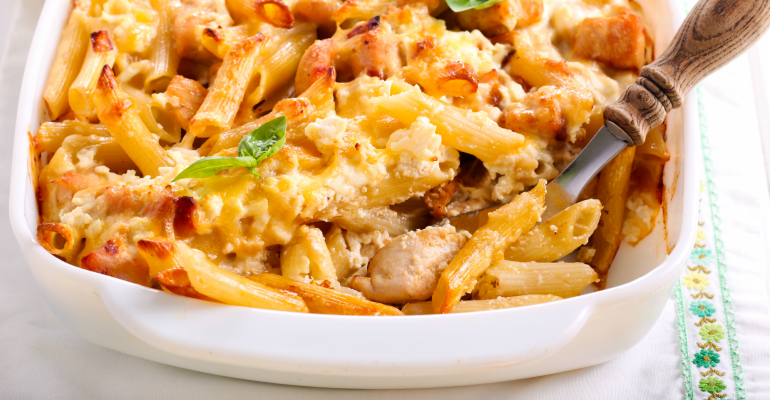 Allow this cheesy chicken pasta casserole to be your saving grace. Has anyone ever asked you about what you would rather have more, a cook, a maid, or a nanny? I have heard that question so many times. I know without a doubt which one I would pick. I like to cook once in a while, but if I didn’t ever have to do it again for the rest of my life, I would be okay with that too. There’s just so much planning and organization that goes into making even an easy dinner, I’d rather just skip the whole thing altogether. Not to mention the messy clean up that has to be done afterward. Unfortunately, that’s only a question. I don’t think that I will ever have my own personal chef. I have a family to feed so I can’t exactly just stop cooking. Instead, I just look for super easy meals that I can toss together in just a few minutes. This cheesy chicken pasta casserole fits that bill perfectly. It didn’t require a ton of ingredients or time, but it tasted like I had spent all day on it. Everyone in my house loved it too. There was barely a drop left in the pan after dinner. USE THE RED NEXT PAGE LINK BELOW FOR THE CHEESY CHICKEN PASTA CASSEROLE RECIPE. Quick Tip: Replace the tomato sauce with alfredo for a whole new twist on this cheesy chicken pasta casserole.